I love vintage ornaments but their delicacy makes me nervous! I decided to make a delicate wire garland and add a couple of seed beads on each wrap so I could hang the ornaments. Something to know about wire is the larger the gauge - the thinner the wire. So 24 gauge wire is thinner than 18 gauge wire. For this project I used steel wire from Lowes. I didn't find the smaller packages of wire at Home Depot or Ace. There are many tutorials on wire wrapping. 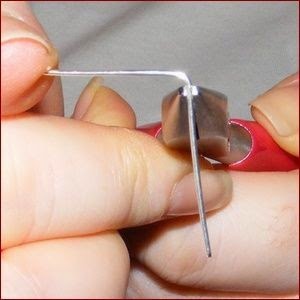 This is the first link I found when I googled how to make a double end wire loop. The tutorial is for jewelry but it is exactly the same concept.